An honest look at the state of Google's note-taking service from a guy who relies on it almost every day. Okay, boys and girls -- time for a personal confession: You might not know it to look at me, but I have the memory skills of an 87-year-old sloth. It's a strangely specific comparison, I realize. But after years of highly scientific self-analysis and countless instances of forgetting things, I've realized my brain reached maximum capacity approximately nine years ago. Even with an SD card stuck into my ear (hey, you can't blame a guy for trying), new data just rarely gets recorded. All right -- so maybe I'm exaggerating a little. But the truth is that most things simply go in one ear and out the other these days, including my own (occasional -- I swear I have 'em sometimes) bright ideas. So when something important pops into my noggin, be it from my own twisted thoughts or someone else's prodding, I've learned to jot it down and make sure I'll be able to find it again when I need it. I'm lucky, because mobile technology has made that process easier than ever. Google's aptly named Keep app has become my tool of choice for collecting and organizing anything and everything -- from story ideas and project notes to random personal stuff like names of nurses from my daughter's birth (for future thank-you-card-writing purposes) to my now-wife's ring size, once upon a time (shh...don't tell her my trick!). Keep has come a long way since its inauspicious-seeming debut in 2013. I've used it on and off since then, flopping around between it and other note management services but always keeping a close eye on its evolution. And around a year ago, Keep worked its way into being a core part of my mobile tech arsenal. As we approach the service's three-year anniversary, I thought it'd be a fine time to look at where Keep now excels -- and where it could still stand to improve. We'll get to the critical part in a minute -- but the truth is that Keep is incredibly close to being an ideal tool for me to collect and manage all of my personal and work-related notes. And, as evidenced by the fact that I continue to use it, its positives outweigh its negatives for me and make it the best all-around option for my needs. Most note-taking apps take a "more is more" approach and present a complicated mishmosh of menus, features, and options. That's great for people who need something especially robust for their virtual notebooks, but for me, Keep's simplicity is actually an asset rather than a limitation (for the most part, anyway -- more on that in a sec). Ultimately, all I want is something that makes it easy to jot down and find quick lists and ideas. I'm not using Keep for budgeting, saving contacts, or organizing travel -- nor am I using it to compose novel-length articles (like, erm, this one). If something is more than a simple note, I work on it in Docs, which is actually designed to be a word processor. Keep is just my place for Post-It-esque quickie thoughts. That's not to say it's completely bare-bones, of course; over the months, the app has gained a number of note-taking basics that were lacking at its launch -- like tools for organizing related notes by tags (which also function like folders). And it's always had the ability to let you do things like dictate notes by voice, attach images within notes, and create checkbox-style lists within notes. What's crucial for me is that Keep maintains a tight focus on simple note-taking, without the mess of supplementary stuff I don't need muddling things up and making it cumbersome to use. For me, less truly is more in this domain. Keep doesn't require any special accounts, subscriptions, or bloated desktop software in order to do what it does well; you just open the Chrome app or Android app, and that's it: All your stuff is there, synced, and exactly how you left it. Everything just works, whether you're online or off, and the same security measures present on the rest of your Google account (like two-factor authentication) are automatically present on your notes as well. That kind of easy universal access is important for me, as I'm often moving between different devices and I need something that requires little thought or hassle. It's equally important for me when it comes to collaboration, as I can just tap an icon within any note and then invite anyone else to view and edit it. As long as they have a Google account -- which most people do -- it's painless as can be. Whether it's my wife or a colleague, that person can be seeing and optionally adding to my note within seconds (and without any annoying sign-up or sign-in process required -- heck, they can even just go to the Keep website, if offline access doesn't matter). This is probably the single biggest benefit that keeps me committed to Keep: It has a spectacular system for setting reminders that ties directly into other Google services. What does that mean? Simple: I can create a note in Keep and then tell the app to remind me about it at a specific date and time or even when I'm at a certain location (say, a friend's house or the grocery). When the appropriate time or place arrives, I'll get a notification on my phone and on any other device where I'm signed in. The reminder will also show up as an item in my Inbox -- so if I don't mark it as done right away, it'll be waiting for me in a place where I frequently look and am bound to see it. As such, there's no chance it'll get brushed aside and forgotten. For a noodle-brain like me, that sort of cross-app harmony makes a world of difference. I can always peek in on any upcoming reminders within Inbox, too, as well as within Google itself (by entering "Show me my reminders" into any search prompt on any device, mobile or PC, where I'm signed in). 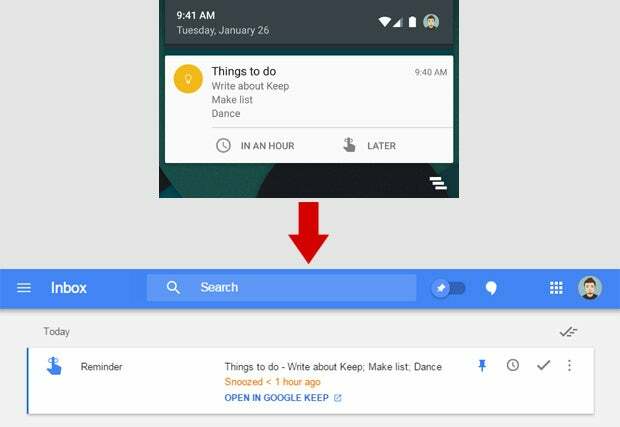 Google has essentially developed a cross-platform, Google-wide reminders system, and Keep just happens to tap into it. Keep's simplicity is part of what makes it work for me -- but you know what? Simplicity is a sliding scale. 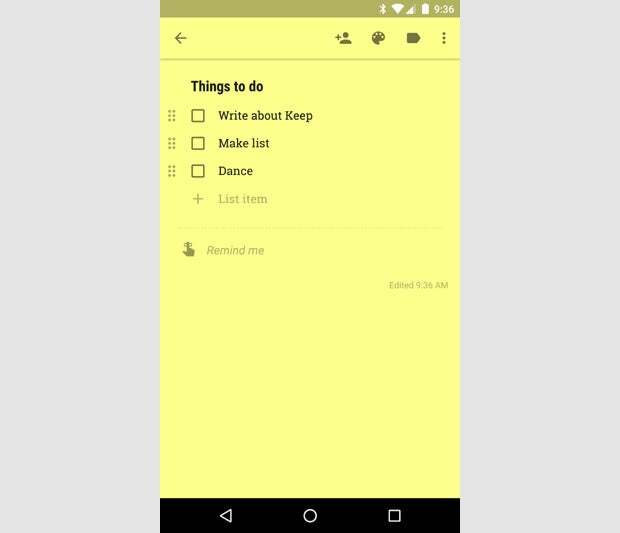 And three years after its debut, Keep is still lacking a handful of surprisingly foundational features that'd make it a much more compelling note management service. Like I said earlier, Keep really isn't meant for long-form document work; that's why Google Docs exists. But it'd sometimes be useful to be able to throw a bold or italicized line into a note -- and somewhat bafflingly, Keep doesn't provide a way to do that. Again, I know it's not a full-fledged word processor, but there are times when you accidentally delete a chunk of text from a note and don't realize it until it's too late (trust me: It happens). 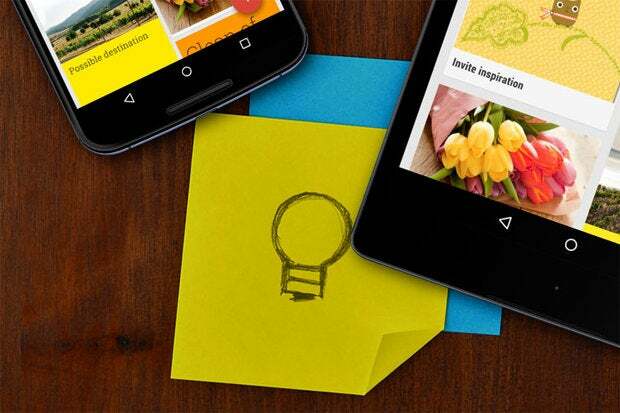 Having the ability to revert to a previous version of a note would give Keep a meaningful extra oomph of utility -- and give its users some welcomed peace of mind. Google's great at search, and Keep is no exception: You can type any word into the search box at the top of the app and find every note in which said term appears. But you know what you can't find? A "find" command to look for a specific word or phrase within an individual note. Say I want to find an idea I jotted down for a story about fluorescent fishies within my sprawling "Story Ideas" note. I can search Keep for "fluorescent fishies," sure -- and it'll show me the right note where that term can be found. But from there, I'll have to skim through all the text of the appropriate note in order to get to the right place. Even within the Chrome app, hitting Ctrl-F doesn't do anything other than create frustration (though maybe that's its actual function?). Give me a "find" command, Keep, and let me keep my sanity before it's completely lost. By default, Keep organizes your notes into cards that appear in the order they were created. You can drag and drop notes to reorder them -- but anytime you create a new note, it automatically appears at the top of the heap. Me? I have certain important notes that I like to keep at the top of my list so they're easily accessible. That means whenever I create a new note, I have to then drag it down a few spots in my list to get it out of my high-priority slot(s). And I can't be the only one in that situation. Being able to pin a note or multiple notes to the top of the app would be a fantastic feature for Keep to have -- and would add some much-needed power into its card-based system while still allowing it to remain simple. You can access, edit and create new notes on the web at http://drive.google.com/keep and in the coming weeks you'll be able to do the same directly from Google Drive. This isn't an enormous deal, by any means, but given how closely Keep and Docs are designed to work -- with Keep being for notes and Docs being for documents -- it actually would be useful to be able to pull up notes within the Drive interface (in a similar way to how you can access your photos from Google Photos within Drive). I'm not sure why Google changed its mind on this, but getting back on track with the plan would benefit users and make Keep feel like a natural part of the Drive productivity suite instead of a lower-profile and easily overlooked standalone app. As I said a few minutes ago, Keep's positives very much outweigh its negatives and make it a compelling note-management service for someone like me -- someone with basic note-taking needs and a Google-centric tech setup. Features like simplicity, easy universal access, and native integration with other Google services are powerful perks that are difficult (or even impossible, in the case of the integration) to match. The good news? With just a little more evolution, Keep can address its lingering weaknesses and become the polished productivity tool it's so close to being. Here's hoping someone's taking notes.